Dan Clements scored the winning goal for Peterborough Sports against Wisbech. It’s now an astonishing 27 home league wins in a row for Peterborough Sports. But the city side had to work hard to see off Wisbech Town in the United Counties Premier Division at PSL tonight (October 4). Dan Clements scored the only goal of the game in the 63rd minute to maintain Sports’ three-point lead at the top of the table. Scott Mooney scored the winning goal for Deeping Rangers against Sleaford. 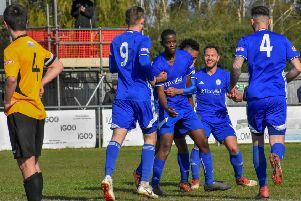 It was a third win this season for Sports over the Fenmen following 4-1 and 3-0 successes at Fenland Park in the FA Cup and UCL Premier Division respectively. Sports are three points clear of Eynesbury who kept up their challenge for top spot with a 5-0 duffing of Wellingborough Town. Holbeach host Yaxley in the Premier Division tonight (October 5) when the latter will be seeking recenge for an early-season defeat in the reverse fixture. Peterborough Northern Star will expect to win at bottom club Huntingdon Town. In Division One last night Bourne continued their improved form with a 2-1 win over Thrapston at the Abbey Lawns. Back-to-back home wins have lifted ‘The Wakes’ up to 14th. Blackstones will try and win just a second Division One match of the season tonight, but it won’t be easy at home to second-placed Oakham. Deeping Rangers pipped UCL Premier Division rivals Sleaford 3-2 in the Lincs Senior Trophy last night thanks to a late goal from Scott Mooney. Deeping had led 1-0 after just two minutes thanks to a David Burton-Jones’ strike, but trailled 2-1 until Henry Dunn levelled with a 25-yard screamer. Bourne Town 2, Thrapston Town 1. Deeping Rangers 3 (Burton-Jones, Dunn, Mooney), Sleaford Town 2.